Barreado: The Famous Typical Dish of Paraná State! Barreado, a typical dish of Parana State, Brazil, is a slow-cooked meat stew prepared in a clay pot whose lid is sealed with a sort of clay made from wheat or cassava flour, hence the name (which means, literally, “muddied”). 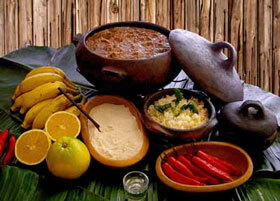 Barreado: the famous and tasty typical dish of Paraná State! Morretes, Antonina and Paranagua, in Parana, dispute the title of “who invented the Barreado”. In interviews to the Brazilian online magazine Globo Rural, locals from Morretes attribute the origin of Barreado to indigenous people, Paranaguá residents say it was created by the tropeiros, or donkey caravan tradesmen and in Antonina it is said that the famous dish was locally created during Carnival, as a hearty food that could be prepared slowly while everyone was partying. The cooker is covered and then “barreada” (sealed) with a paste of ash and farinha (manioc flour), and then slowly cooked in a wood-fired oven for 12 to 18 hours. Traditionally, Barreado is made of beef, bacon, tomatoes, onion, cumin and other spices, placed in successive layers in a large clay urn, covered and then “barreada” (sealed) with a paste of ash and farinha (manioc flour), and then slowly cooked in a wood-fired oven for 12 to 18 hours. This process which, in the past, was carried out in a hole in the ground, nowadays pressure cookers and gas or electric ovens are sometimes used (trough not by better restaurants). 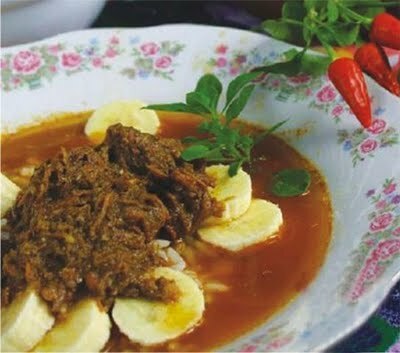 Barreado is served over cassava flour, with round banana slices and pepper. The meat juices are mixed with the flour to make pirão – a kind of gravy. To drink, Caçhaça is traditionally served with barreado, resulting in a great and tasty combination. 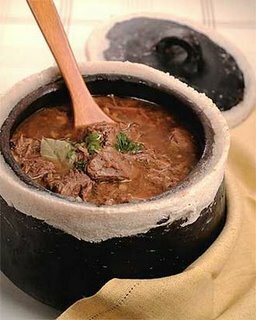 In Paraná’s costal towns (specially Paranagua, Morretes and Antonina), Barreado in the region is equivalent of feijoada and it appears on most of restaurants’s menus. Though tasty enough, barreado is very heavy and a rather more appropriate dish for a chilly winter evening than for summer and Carnaval, as originally intended. The best restaurant to taste this delicious typical dish of Parana’s coast is at the restaurant “Casa do Barreado”, famous for its award-winning Barreado. The restaurant located in Paranaguá was voted Best of Parana by Guia Quatro Rodas for the tenth consecutive year. The restaurant opens every weekend and during weekdays, only by reservations! MORRETES: Restaurante Ponte Velha (Rua Almirante Frederico de Oliveira, 13 – Phone: 41 3462-1674) [more restaurants in Morretes]. ANTONINA: Restaurante Buganvil’s (Rua Vale Porto, 10 – Phone: 41 3432-1434) [more restaurants in Antonina]. CURITIBA: Restaurante-Escola do Senac, every Thursday at lunch only! (Rua André de Barros, 750 – Centro / Phones: 41 3219-4853 , 3219-4854 or 3219-4855) ) [more restaurants in Curitiba].